It is "extremely challenging" for councils to ensure children taught at home in England receive a suitable education, inspectors have warned. Ofsted said the absence of a home education register meant authorities did not have a full picture of how children in their area were taught. There is no official figure for how many UK children are home schooled, but is estimated to be around 50,000. Proposals for a register for home educators were shelved in April. Home educators rejected the suggestion that a register for home-schooled children was necessary. While acknowledging that the vast majority of home schooled children were happy with their education, the Ofsted report said it was a challenge for local authorities to meet their statutory duty to ensure all children had a "suitable education". Currently, parents in England are not required to inform either the local authority or any other public body that they are educating a child at home, unless the child is being removed from a special school. Inspectors warned: "There was no reliable way to establish how many children were resident but 'invisible', having never entered the school system." 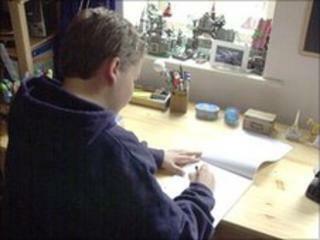 The previous Labour government came close to bringing in a compulsory register for home educators in England, following recommendations made in a review of home education by former Kent education chief Graham Badman. But former Schools Secretary Ed Balls was forced to drop the plan just before the general election, when he failed to win Conservative support for it and a slimmed-down version of his Children, Schools and Families Bill was pushed through parliament. For its report, entitled Local authorities and home education, Ofsted spoke to 120 parents and 130 children from 15 local authority areas between September and December last year. Inspectors found the children they spoke to were enthusiastic about being educated at home. Just over half the parents surveyed were home educating because they were frustrated by experiences they and their children had had while at school. Bullying was a factor for around a third of parents and over a quarter of the 130 children whose parents spoke to inspectors had a statement of special educational needs. But inspectors stressed the difficulty for local authorities in keeping tabs on all children who were not being taught in school. Chief inspector Christine Gilbert said: "Current legislation around elective home education means it is extremely challenging for local authorities to meet their statutory duty to ensure children have a suitable education." A spokesman for the home educators' group, Education Otherwise, said: "We note that the contents of this report seem remarkably similar to the now-discredited Badman report, which parliament rejected before the general election. "We are confident that the new government's commitments to civil liberties and a smaller state means they will reject these recommendations out of hand." A spokesman for the Department for Education said: "We respect the right of parents to home educate their children. "The Ofsted report confirms that most parents who educate their children at home do a very good job, some of them picking up the pieces where children have had problems at school. "We note Ofsted's findings and recommendations and ministers will shortly be considering if changes need to be made to the existing arrangements, given the strong views expressed by both home educators and local authorities." In Wales, as in England, there is no requirement for parents to inform local authorities of the fact that they intend to educate at home. In Scotland, parents are entitled to home educate, but need consent if this involves removing their child from school.